It's true. There's a voice in the hit song "Thinking Out Loud" other than Ed Sheeran's, and netizens believe the "creepy" voice came from a child. 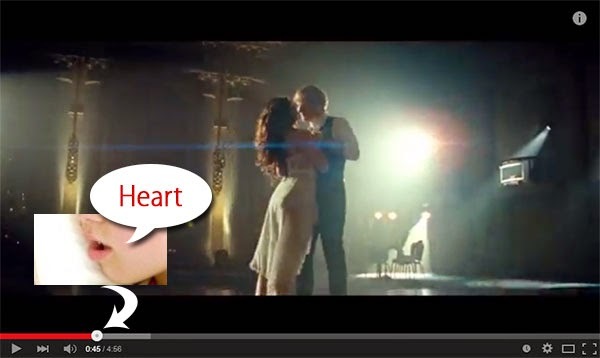 At the 45th second of the official music video, you can hear someone saying "heart" following the singer's voice. This sent social media users buzzing online, making "Thinking Out Loud" one of the top trending topics on Twitter on Sunday, April 12. Many said they were puzzled while some said it was fake and has been circulated to scare people, but Facebook user Michael Vincent has a 'scientific' explanation about it. Michael confirmed that there's another voice in the song, which is part of the "outlay" of the "second voices." 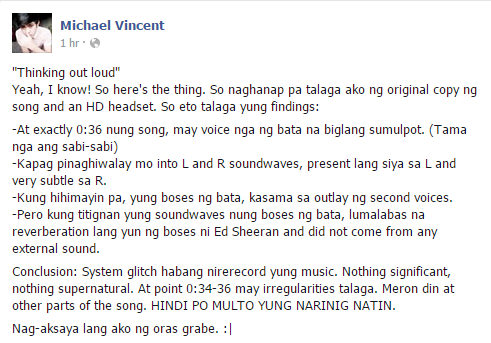 However, upon looking at the "soundwaves" of the kid's voice, he said it turned out that it is a "reverberation" of Ed Sheeran's voice and "did not come from any external sound." With the conclusion that the "creepy" voice was a "system glitch" that occured while the music was being recorded, Michael said: "Nothing significant, nothing supernatural."